We have an entire portion of our store dedicated to essential party tableware in a rainbow-assortment! 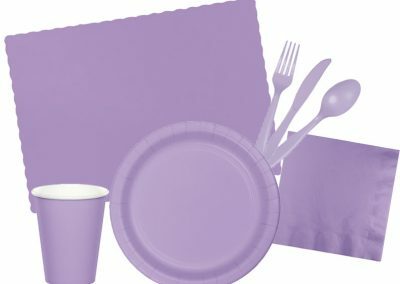 Find exactly what you need for your next event: cups, plates, napkins, tablecloths, table skirts, flatware, and decoration items (banners, streamers, etc.) Pick a solid color theme, or match multiple colors to bring texture to your party! Don’t forget our patterned products: stripes, polka dots, chevron, and more! Our items are of great quality and offered at an affordable price. Need inspiration? Our Party Store associates can provide with you fresh ideas to make your party fun and exciting. While you are in our Party Store, browse our countless themes for birthdays, baby showers, gender reveals, holidays and other themed parties! Our colored party tableware can compliment any theme in our store. We are excited to help you bring your perfect party or special event to life! For your convenience, our colored party tableware is available to purchase online. Order now and your party supplies will be delivered directly to your home! If you have any questions, feel free to contact us.